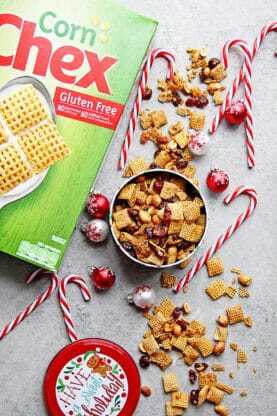 Disclosure: I partnered with Chex for this Cranberry Orange Chex Party Mix recipe post, but all opinions expressed here are my own. I am grateful for authentic partnerships like this. 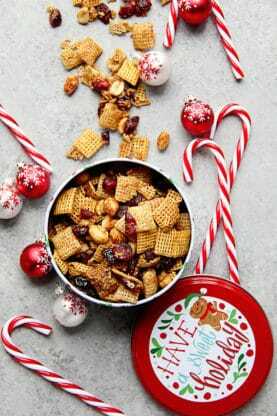 Cranberry Orange Chex Party Mix- The ultimate holiday snack perfect for all your winter entertaining! My holiday entertaining is in full gear. 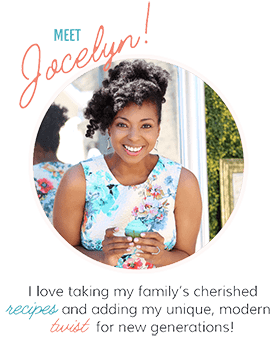 My BabyCakes and I have at least four different parties on our calendar this December, and I have been working on some effortless entertaining recipes that can easily be transported to shindigs or thrown together quickly if guests happen to pop over. I have always been such a huge Chex Party Mix fan because of the ease and delicious taste. Very few recipes can combine both characteristics as perfectly as Chex Party Mix can. 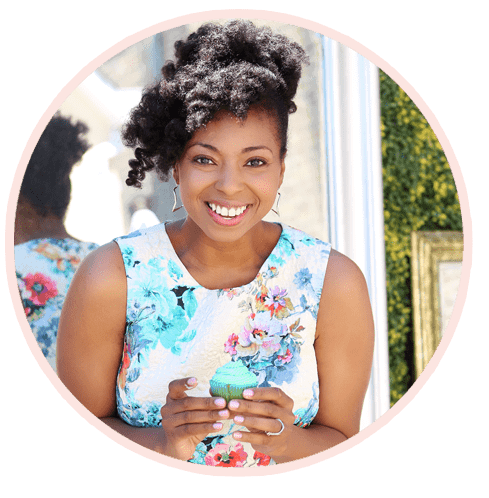 I can have a mix ready to go in 15 minutes or less for all of my holiday parties. I can make it ahead or even on the fly for impromptu entertaining. And talk about a crowd pleaser! No one can get enough. I usually have to make two batches just to keep everyone happy and satisfied. And with such a small time investment, it totally makes sense to do it. Chex Party Mixes are also incredibly adaptable. The sky is truly the limit on flavor combinations. I thought I would have a little fun with some perfect winter flavors that make you feel holiday ready in an instant. Cranberry and Orange always come to mind for me around this time of year. 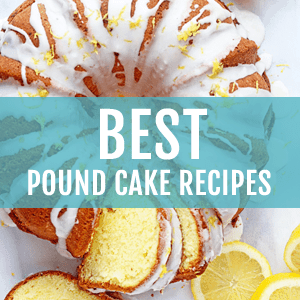 It is such a classic flavor combination that combines tart, citrus and sweet in the most balanced way. 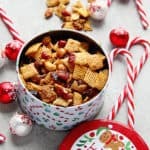 I knew it would be sensational in a holiday Chex Party Mix recipe. 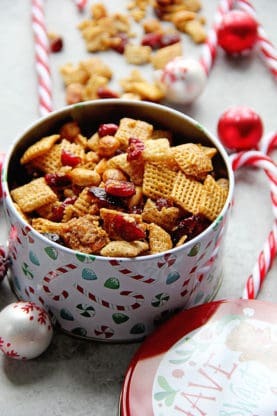 To really amp up the orange flavor in this Cranberry Orange Chex Party Mix, I used a combination of orange juice and zest so it really shined through. The dried cranberries are perfectly sweet and soft. I love getting the little bites here and there throughout. The brown sugar, cinnamon and honey roasted nuts also give it a nice sweet kick as well to balance the citrus flavor. 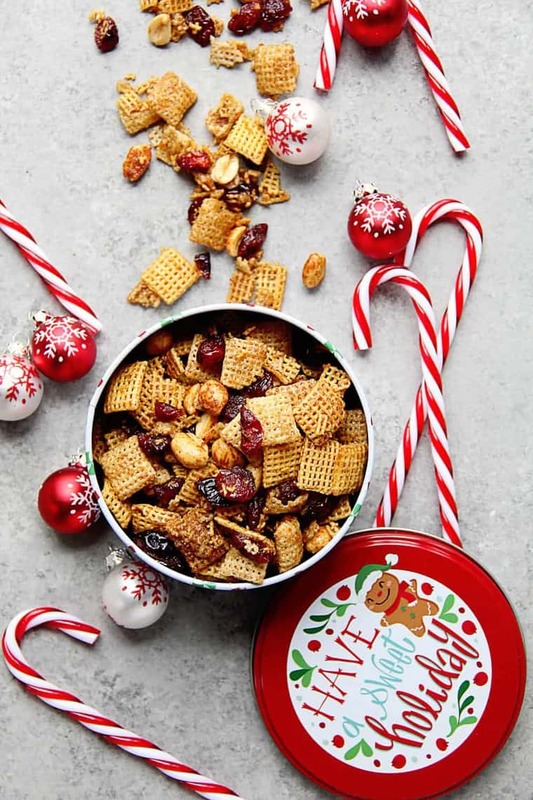 Whether you are throwing holiday parties of your own or heading to someone else’s, make sure you whip up this super easy and delicious Cranberry Orange Chex Party Mix for all of your entertaining needs. 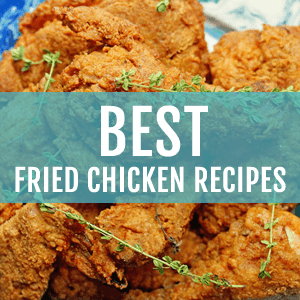 Once guests get a taste of this, you might become the go to for all holiday entertaining recipes. The ultimate holiday snack perfect for all your winter entertaining! 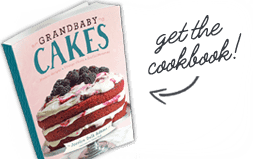 In a large microwavable bowl, mix 9 cups of cereal, dried cranberries and peanuts. Toss in brown sugar, orange zest and cinnamon over Chex. In a microwave or in a medium sized pan, melt butter and orange juice together over medium high heat. Once melted, drizzle over cereal mix stirring everything together. Microwave cereal mix for 1 minute then stir one last time to coat everything. Spread cereal on a paper towel lined baking sheet and allow to cool. Once cooled and set, store and serve. My kids are going to love this snack! Chex party mix is a must for the holidays! This looks great! I could eat this ALL year long!! De-lish!!! I really love how festive this looks, but I bet it tastes even better! This is perfect for holiday parties! I am a sucker for all things cranberries so this is going on the to do list now! oh I love the flavors of this Chex Mix!! adding this to my holiday party list! This sounds SO GOOD! I love the orange cranberry flavor!